We are spending the first week of our holiday in Fregene, near Rome. Most of the beaches here are run as private beach clubs or 'stabilimenti'. Those few public beaches left are littered with trash, have little or no waste bins, no facilities and look like then are never cleaned up. Paper wraps, plastic bottles, cigarette butts, broken glass and a lonesome car tire decorate the public beach we walked on two days ago. The private beaches, or stabilimenti, run all the way from the beach road to the water, and often consist of a bar and restaurant, toilet and changing facilities. They rent out beach chairs and umbrellas, and some also have a small pool, beach volley-ball nets and a climbing toys for the kids. 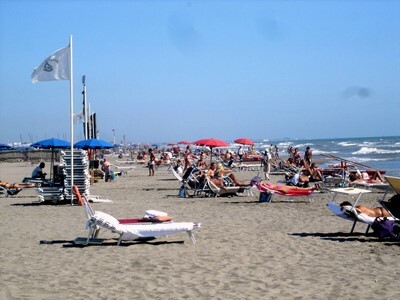 Their beaches are cleaned up daily, and are relatively clean - dependent a bit on which stabilimenti you choose. 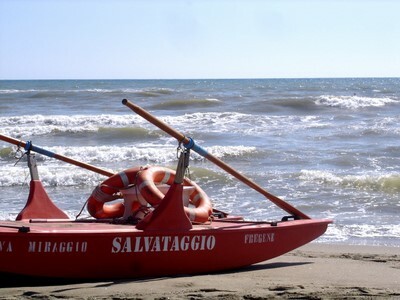 When we went to beach around Monday, I was surprised about the price tag for a family of four at the Italian beach... Four beach chairs and two umbrellas set us back for €56 (say around US$90). Access to the pool was extra. A down to earth coffee and cornetto (a croissant) breakfast for four in one of the beach side cafes costs around €30 (US$48). A two simple course lunch for two adults and two kids typically will go no less than €100 (US$160) and a dinner easily sets you back for another €150 (US$240). Knowing Italians are sun seekers, no wonder protests about beach prices start hitting the news, even abroad.